Are You "Putting Off" Salvation? Here is a vital principle which could mean your eternal life! Will YOU LOSE your salvation by neglecting to practice it? GREETINGS, brethren, from South America! Mr. Benjamin Rea, the head of our Spanish Department at Ambassador College, and I are traveling through parts of this continent, gathering information to be used in future articles in the Good News and the Plain Truth, searching out books for our Spanish Department, and taking time now and then to write to you, through articles in the magazines. 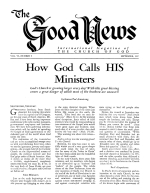 Many times, we have printed articles in the "Good News" about your Christian life, about the necessity of perseverance, of zeal, of real ENTHUSIASM in order to overcome, and obtain salvation. But God has revealed to me a vital principle, which, if you will PUT IT INTO PRACTICE, could very easily make the difference between LOSING OUT by either falling into the LUKEWARM condition of the Laodiceans or letting a root of bitterness spring up in your heart and turn you away from God's Church, or — ON THE OTHER HAND — of remaining faithful and gaining eternal life in God's kingdom! Have you never wondered why it is that God takes so much time and space to WARN us, by EXAMPLES, and by direct statements, about falling away? Even in, this present age, filled with the turmoil of a dying world — with our ears attuned to the shrieks of the millions of suffering humans we read about every day, with the prophecies of YOUR BIBLE being fulfilled each day — some have FALLEN AWAY! Some have NEGLECTED to put these "little things," as they may have called them, into practice, and for that reason, THEY ARE NO LONGER A PART OF GOD'S CHURCH! In ADDITION to His prophecies of a WORLD-WIDE apostasy and falling away from the truth (Matt. 24:5,11-12), Jesus foretold of a terrible state of LUKEWARMNESS in His own Church! (Rev. 3:15-17). He said, "... when the Son of man cometh, shall he find FAITH on the earth?" (Luke 18:8). Jesus was constantly reminding His disciples of the grave possibility of FALLING AWAY. In His parable of the sower, He described the various types of persons who would hear the word — His very Gospel of the Kingdom, and would receive it with JOY, and yet would not ENDURE to the end. "But he that received the seed into stony places, the same is he that HEARETH the word, and anon with joy receiveth it; yet hath he not root in himself, BUT DURETH FOR A WHILE: for when tribulation or persecution ariseth because of the word, by and by be stumbles" (Matt. 13:20-21). Notice, this person didn't have ROOT in himself. The root is the source of the FOOD SUPPLY for the plant — and that which gives it STABILITY in the ground. If you are not DRINKING IN of the "milk" of the word (I Pet. 2:2) being ROOTED and GROUNDED in the truth, YOU will fall away and be burnt. Jesus described the next class of persons as being those who receive the word among THORNS. "And the care of THIS WORLD, and the deceitfulness of riches choke the word, and he becometh unfruitful" (Matt. 13:22). Paul, about to depart from the brethren he loved so much at Ephesus, said, "For I know this, that after my departing shall grievous wolves enter in among you, not sparing the flock. Also of YOUR OWN SELVES shall men arise, speaking perverse things, to draw away disciples, after them" (Acts 20:29-30). Paul was VERY familiar with the human pulls of the flesh, with the vanity, the lust, the greed, and the utter SELFISHNESS of human nature. He battled during his entire ministry to preserve the flock from danger, and to SAVE it from destruction. He wrote to the people in Lystra, Derbe and Iconium, "I marvel that ye are so soon removed from him that called you into the grace of Christ unto another gospel" (Gal. 1:6) and went on to show they had been LED OFF by failing to PRACTICE the things he had taught them during his ministry there. All through the New Testament, God gives us warning after warning of the grave DANGER of falling away. Paul's writings are filled with them, Christ spoke of them often, Jude said it was necessary to get back to the ORIGINAL FAITH! (Jude 3) John then recorded Jesus' words, that a WHOLE ERA — ONE WHOLE PHASE of God's own Church would fall into a disinterested, self-satisfied, neglectful, lethargic LAZY attitude — and be SPIT OUT! (Rev. 3:16). WHY, oh WHY can't some of you SEE THIS TRUTH? I know of a surety, as I write these words here in a hotel room in Buenos Aires, some 9 or 10 thousand miles from Pasadena, that most of the VERY ONES who are NOW in this spiritual DANGER will carelessly read this article — AGREEING with it, as they always do — and then go right on, STRAIGHT TOWARD GEHENNA FIRE! And yet — even knowing this — I know I must go ahead and write this article. May the Almighty Creator SHAKE some of His people — perhaps YOU — until your very teeth rattle, if need be, until you can be snapped awake, and brought to a peak of spiritual zeal! As you read these words, perhaps you are actually AWARE of a great deal of spiritual lethargy that exists in your life. You don't PRAY as you should, you can't seem to spend the time STUDYING that you should, and you just don't feel as "spiritual" as you KNOW you should! That probably describes the MAJORITY of God's people during this age. And yet, EVEN KNOWING THEY ARE SPIRITUALLY LAX, many are going to continue toward ultimate destruction — simply because they are failing to OVERCOME this known and recognized trait. BECAUSE THEY DON'T REALLY WANT TO OVERCOME IT! Does that shock you? It really shouldn't — because it is an actual fact — easily recognizable by the fruits of many of God's own called and chosen people in this age. Are YOU a person who desperately NEEDS something of God? Are you constantly beseeching your Heavenly Father for some great gift, some answer to prayer? Are you in need of healing? And, AT THE SAME TIME, are you subconsciously saying to yourself, "I'll 'get spiritual' enough for God to HEAR my prayer — I'll 'do some righteousness' until I GET the answer, and then it'll be over — then I can drift again — then I can, after I've achieved my purpose, drift back into the easy-going stream of lethargy, because it's so MUCH EASIER? YES! Many ARE doing exactly that! Do YOU ever decide, along about Thursday afternoon, or perhaps late on Friday, that the Sabbath is coming, so you'd better get into a "spiritual mood" before it catches you in the attitude you've been in during the middle of the week? Do you then get into a TEMPORARY state of "righteousness" until Saturday night? Are you much HAPPIER when the SUN GOES DOWN, so you can rush out to the pleasures of THIS WORLD? Or do you wish the sun wouldn't go down so SOON, and that the Church service might not be over so SOON, or that you could visit with others of God's Church LONGER? If these things describe YOU — then chances are, you're AWARE of your condition — yet seem to be powerless to DO anything about it. Regardless of HOW close to God a person becomes — SIN is always near! Most of us have not really understood just how EASY it is for us to "slip over the line" and let the "bars" down — drifting into our old ways and habits, and sinning against God by our actions. When Jesus was perhaps the very CLOSEST to God, during His long fast of 40 days and nights in the wilds of Palestine, Satan came to Him, PERSONALLY, to tempt Him. Are you more immune than Christ? Paul said, "I find then a LAW, that, when I would do good, EVIL is PRESENT WITH me" (Rom. 7:21). Paul said he RECOGNIZED the evil tendencies in his flesh — he knew his nature made him do the opposite from the good he WANTED so much to do, "For that which I do I allow not: for what I would, that do I not; but what I hate, that do I" (vs. 15). He said he DIDN'T KNOW HOW to perform that which was good! (vs. 18). But God showed him. "For they that are after the flesh do mind the things of the flesh ... for to be carnally minded is death ... because the carnal mind is enmity against God ... so then they that are in the FLESH cannot please God, but ye are NOT IN THE FLESH, but IN THE SPIRIT, if so be that the Spirit of God dwell IN you" (Rom. 8:5-9). The Spirit of God DID dwell in Paul, "Christ liveth IN me" (Gal. 2:20), "For I DELIGHT in the law of God after the INWARD man ... so then with the mind I myself SERVE the law of God" (Rom. 7:22 & 25). All of us must come to see that we are literally standing on a huge precipice, with our backs to the damp, horribly gaping maw of debauchery and DESTRUCTION! We must come to realize that wherever we are, at whatever time, Satan will try to ensnare us in whatever way he can — by playing on OUR PARTICULAR WEAKNESSES! It is perhaps so simple, it won't sound like a very important point to you — but the real basic cause for much of this spiritual lethargy in God's Church is an attitude of PUTTING OFF everything until LATER, of GOOD INTENT, coupled with NEGLECTFULNESS, which COULD finally result in putting off your own salvation! For example, you have come to see you really need to TALK to God more — or have you? — and you have decided to DO something about it. You have made up your mind. THIS TIME you really MEAN it! So, when it comes time to go to bed, you're very, very tired — and your mind just doesn't function very well. After only a few minutes of drugged, half-awake prayer that didn't go any higher than the ceiling, you tumble wearily into bed — intending fully, and even PROMISING yourself that SURELY you'll "make up for it" tomorrow morning! Tomorrow morning arrives. You have overslept, or perhaps you have children, and they awakened sooner than you planned — perhaps the telephone rang early, or SOMETHING happened — maybe you even FORGOT about it, but, at any rate, you didn't PRAY as you intended! DO YOU "put off" praying until a "more convenient time?" Some in God's Church still smoke. You know that others know it — in fact, you may have even told them about it. Some of you have told ME, or else I may know it just because the strong smell of the smoker is almost impossible to conceal from the non-smoker. Smoking is not the cardinal sin of the world — it is not the WORST sin there is, so to speak — BUT IT IS A SIN! So is chewing tobacco — and so is "dipping snuff!" I used to smoke, as did many others in God's true Church. But I was just exactly like a lot of YOU. I always "put off" quitting, because I would say to myself, "Well, this will be absolutely my LAST cigarette! I'LL SMOKE JUST THIS ONCE MORE, and THEN I'll really use a lot of WILL power, and I'll just quit!" But — after having just that "one more" I would say the identical thing the NEXT TIME, and the NEXT, and the NEXT, until I was constantly "kidding myself" that I was in the PROCESS of quitting, whatever THAT is. But there IS no such thing as a PROCESS of quitting — you've just got to QUIT! Are YOU like this? I was, but now I can give thanks to the Creator that I was GIVEN the necessary WILL POWER to quit. By a severe case of laryngitis, in which I lost my voice completely, I became so FRIGHTENED, about LOSING my voice that God has given me, that I just QUIT! Not only are smokers — like I USED to be — CONTINUALLY defiling the temple of God's Holy Spirit, and setting a terrible example for others, but are constantly telling themselves, and God, a LIE, that they are in the "process" of quitting! It's so easy to tell yourself that you'll get around to really DOING things tomorrow. In this way, many have been PUTTING OFF FASTING. God only COMMANDS you to fast on one particular day, (Lev. 23:32), but by example, by many direct statements of Christ, and by the teaching of the Apostle Paul, we know you MUST FAST OFTEN if you are to remain a spiritual minded Christian. Jesus FASTED. It was because of His CONSTANT nearness to God that He was able to cry out, even with TEARS, to God for deliverance from the temptations of the flesh (Heb. 5:7). That's HOW He can be a merciful High Priest to us now — because through FASTING and prayer, Jesus was SO CLOSE to God, that even when evil impulses and temptations came, He was able to cast them from Him. "For we have not an high priest which cannot be touched with the feeling of our infirmities; but was IN ALL POINTS tempted like as we are, yet without sin" (Heb. 4:15). Even in fasting to stay close to God, Christ set YOU an example (I Pet. 2:21). Turn to John, the eleventh chapter, and read again the wonderful history of how the living Head of Our Church RAISED A MAN (Lazarus) FROM THE DEAD! Jesus was so deeply moved by the LACK OF FAITH of the people that he "groaned in the spirit, and was troubled" (vs. 33), and finally He wept (vs. 35). But when He came to the tomb, Jesus "lifted up his eyes and said, 'Father, I thank thee that thou hast heard me. And I knew that thou hearest me always: but because of the people which stand by I said it, that they may believe that thou has sent me" (vs. 41-42). Time that short prayer! I did, with my stop watch, and even saying it slowly, it only takes eleven seconds! "And when he thus had spoken, he cried with a loud voice, 'LAZARUS COME FORTH!'" (vs. 43). And a man who had been DEAD four days walked ALIVE out of his tomb. WHY was Christ able to speak only a short, eleven-second prayer, and PUBLICLY, in front of the people there, and still perform one of His greatest miracles? Simply because He was FASTING and praying CONSTANTLY, not just working up a TEMPORARY "spiritual attitude" to perform some great thing — not just "getting in the mood" for a WHILE. He was in such constant communion with God, that He needed only to lift His eyes to heaven, and break off ONE conversation, with other human beings, and begin a NEW conversation — with His Heavenly Father. Remember, Jesus is YOUR EXAMPLE. But, sadly enough, most of us don't have the WILL POWER Jesus had. We constantly tell ourselves, "Well, I'm too hungry today, I'll put it off until tomorrow'' or, "I've got too much work to do, that will require all my physical strength — I'll put it off until later" or, "I won't have a good opportunity to PRAY today, so the fasting would only be starving my physical body for nothing — I'll WAIT until I'm not so busy!" In just this fashion, YOU CAN DRIFT RAPIDLY INTO A STATE OF SPIRITUAL LETHARGY! GOD'S CHURCH IS NOT FASTING ANYWHERE NEAR ENOUGH! This type of neglect is about like the farmer whose roof leaks. Always, when he is reminded about the holes in the roof, he begins to reason, "Well, it's not RAINING now, and I've got so much else to do — I'll put it off until tomorrow." Tomorrow comes, and then several tomorrows, until it finally RAINS, and he is forced to scatter several pots and pans around in the house to catch the rain water coming through the holes in the roof. He certainly can't get up on the roof in the RAIN, can he? And then — after the rain has stopped, he thinks there is no NEED to repair the roof yet, because it isn't raining anymore! Are YOU like that farmer? Brethren, NEVER FORGET that "... the time IS COME that JUDGMENT must begin at the house of God: and if it first begin at us, what shall the end be of them that obey not the gospel of God?" (I Pet. 4:17). If you're constantly PUTTING THINGS OFF until tomorrow, you're being judged on the strength of EMPTY PROMISES and HYPOCRISY! Rather than real WORKS being noted in your record, you have a record filled with half-hearted promises and "good intentions." GOOD INTENTIONS are not going to save one single soul from the damnation of physical agonies and final spiritual death! If they could, then God would allow almost the majority of the sinning, ignorant, degenerate humans on earth into His glorious Kingdom! You'd better get busy while the sun is shining, and stop up that leaky roof — FILL THE GAPS in your study and prayer habits, until you're ready for the strongest TYPHOONS and HURRICANES of temptation and persecution — because THEY ARE COMING! Peter warns us "... the end of all things IS AT HAND: be ye therefore sober, and watch unto prayer!" (I Pet. 4:7). We are exhorted to be diligently WORKING OUT our own salvation, with fear and trembling (Phil. 2:12) and to be putting off DAILY the traits and characteristics of the "old man" of SIN! (Col. 3:9-10, I Cor. 15:31). Jesus illustrated this DAY-BY-DAY fight of the Christian when He said, "Sufficient unto the DAY is the evil thereof" (Mart. 6:34). You've got to conquer today's problems TODAY — not make empty promises about "getting around" to it tomorrow! Christ tells us, "Let your loins be girded about, and your LIGHTS BURNING; And ye yourselves LIKE UNTO MEN THAT WAIT FOR THE LORD, when He will return from the wedding; that when he cometh and knocketh, they may open unto him IMMEDIATELY!" (Luke 12:35-36). Are we going to say to Christ, "I'll get up and let you in TOMORROW" at His coming? "... If any man will come after me, let him deny himself, and take up his cross DAILY, and FOLLOW me" (Luke 9:23). Jesus said it is a day-to-day process! Notice the example of the Bereans, who were so intrigued by the teaching of the Apostle Paul that they "searched the scriptures DAILY ... THEREFORE many or them believed" (Acts 17:11-12). Many are comforting themselves by telling themselves, "I'm TRYING to quit this or that ... I'm IN THE PROCESS of doing what I know I should" and, content to be in a constant state of "trying," they never seem to get around to really DOING anything about it! Notice how much emphasis God places on doing things TODAY! "But EXHORT one another DAILY, WHILE IT IS CALLED TODAY; lest any of you be hardened through the deceitfulness of sin" (Heb. 3:13). Perhaps this sounds like a simple key, a rudimentary truth, which is certainly understood readily enough by the majority of God's people. But it is actually much more than that! It constitutes a tremendous, all-encompassing PRINCIPLE, which, IF REALLY PRACTICED, will result in ETERNAL LIFE! QUIT PUTTING THINGS OFF — AS OF NOW. Had you promised yourself you would PRAY more today? THEN DO IT! STOP reading this article RIGHT NOW! It will still be here when you return — but TIME is passing! Go to your closet or bedroom NOW and pray, if you had intended to do so. LEARN THIS LESSON ONCE AND FOR ALL — DON'T PUT THINGS OFF, if you intend to enter God's Kingdom! You can return and finish this article LATER — but you probably WON'T take time to PRAY later. God tells us the coming of Christ is just around the corner in world affairs! It's much later than most of us think! Have YOU been so securely self-satisfied in the knowledge of prophecy God has revealed that you reason in your mind that Christ probably won't come for another FIFTEEN YEARS or more? Have YOU begun to REASON that there remains PLENTY of time — and said to yourself, "I'LL REALLY put on the pressure right down in the last few years — there's plenty of time yet — I'll put off overcoming until tomorrow?" PROBABLY YOU HAVE! But God says to CAST DOWN REASONINGS and FACE the truth! (II Cor. 10:5). "But ye, brethren, are not in darkness, that that day should OVERTAKE you as a thief. Ye are all the children of LIGHT, and the children of the DAY: we are not of the night, nor of darkness. Therefore let us NOT SLEEP, as do others, but let us WATCH and be SOBER!" (I Thes. 5:4-6). Yet many of you ARE asleep! I know some of you BY NAME — and the chances are, YOU KNOW that I know and that other ministers know, and that others of the CONGREGATION know! BUT — what is MOST important — GOD KNOWS! Are you going to continue "kidding yourself" that you'll begin putting on the pressure LATER? Some of you have been physically associated with God's Church for YEARS — AND HAVE NOT GROWN! Every time you PUT OFF until tomorrow what you could accomplish TODAY, you are weakening — and possibly even DESTROYING part of your character! And CHARACTER is the very reason for life! CHARACTER is what you should TAKE WITH YOU into God's Kingdom! Brethren — DON'T let this be "just another interesting article" to you! DON'T read it, agree with it, and then forget about it! DON'T allow Satan to deceive you that you're all right spiritually! You KNOW you're not! Then, in the name of Christ our Saviour, DO SOMETHING ABOUT IT — NOW! DON'T PUT IT OFF ANY LONGER!